Getting used to wearing dentures takes time. This is a guide about getting used to wearing dentures. Any tips to help learn to eat with dentures and talk with them? Sorry you have to go through this. You can do it, you will come out the other side a success. Practice the sounds 55, 33 and 66. Keep going back to your dentist for adjustments, ten times if necessary. You need to be able to wrap your lips around them without ever getting a sore. I am a dental hygienist and was a longtime assistant to a doc who made dentures. Twice we failed, and one was someone who could not stop gagging. He went for hypnosis and had to face an unpleasant suppressed memory to get it stopped. The other was someone whose jaw did not hold the plate, so it fell off when he opened his mouth. Implants helped him. If worst comes to worst, you can get the denture anchored with implants, and they make mini ones that are far cheaper. My patients who have implants say that they are awesome, they really rave about how great they feel and chew. Implants are not for smokers because they don't anchor well. God bless you. Dentures are famous for making strong men cry. When biting down on food from the front of the dentures is it common that the back of the dentures come loose? As your gums heal (from the extractions) you'll experience more of this sort of thing - healing gums 'shrink' as the swelling goes down and the shrinking goes on for up to a year. You'll have been scheduled for appointments over the first year to make adjustments as needed (owing to the shrinking) so be sure to tell your dentist your plate is loose at the back when you bite down. He/she can make adjustments to improve the fit and if you're healing very quickly, you may be completely re-fitted before the year is over. I've been wearing an upper partial plate for a few years now and still need to use an adhesive even after two complete refits as my sinus' and allergy problems cause my gums to swell and shrink intermittently - getting a tight fit is nearly impossible without the adhesive. A quick fix until your next appointment is to use a denture adhesive. There are three types of denture adhesives on the supermarket and drugstore shelves: powder, gel or paste, and strips. I use a powder fix because it's so strong and easy to remove at the end of the day but you may find one of the other types work better for you. Look for a zinc-free product unless you know for sure zinc doesn't bother you - I learned this the hard way and believe me the headache (if you're zinc sensitive) is horrific! After 5 or 6 hours of wearing my dentures, prior to the snap ons, I can hardly wait to get them out. How do I get past this horrible feeling? Also, I feel like a have a huge wad of bubble gum in my mouth that I want to spit out. Is this normal? Will I get "used to" it? I prefer, when home, to take my teeth out and eat soft foods, most frustrating. Any advice? It takes about a month to get used to dentures. If I were really uncomfortable, I would contact the dentist sooner. dentist says "it takes time".... the mouth full with that wad of bubble gum feeling is what is driving me crazy. 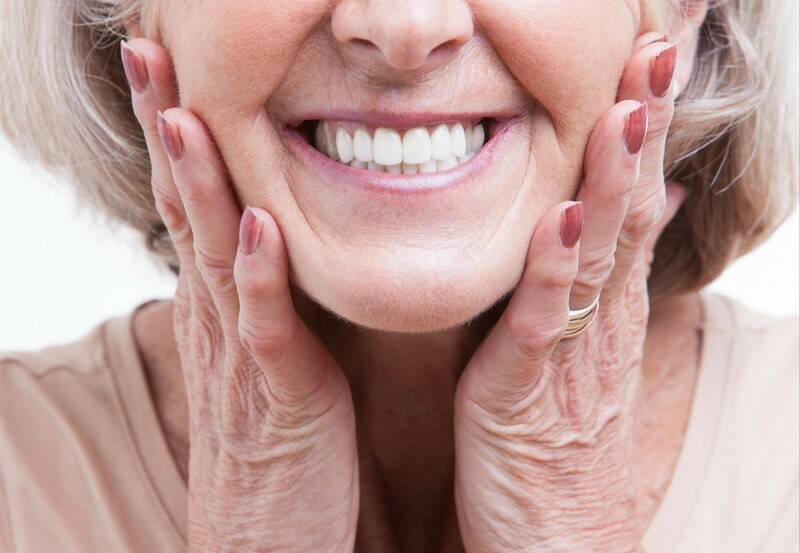 Dentures can cause sore spots on the gums and may need some altering by the dentist. However, the uncomfortable feeling of wearing them is foreign in the mouth; certainly a far cry of the natural teeth. Wear dentures in short spurts; 15-30 mins. at a time when possible and remove for a little while and then put back in until you break them in. Just like new shoes, a breaking in time is required. It is normal to have that full wad experience which is just a part of getting used to them. Eventually, you will not have any of that feeling. It is good that you are keeping in touch with the dentist as he is the expert on the healing/fitting/etc. He is correct, it does take time. You may want to talk to one of the support staff in the his office ask him or her for tips and tricks...I find that like in the case of a dentist my favorite hygienist has amazing hints and tips that the dentist may not think of to share. She is really good has given me tips to keep some ongoing mouth pain I have had over the years at bay...for very long stretches of time with some simple to dos! Wishing you all the best!! New normals take time to adjust to! But change is the only thing that keeps us moving forward so roll forward with it and it gets easier every day!! Will send up a bunch of prayers for you! the other thing to think about is you may be the sort who will NEVER be used to or feel comfortable with dentures. I know I could never for the life of me do contact lenses, as much as I woulda preferred it. tHANKS to everyone who sent in answers and suggestions. I just got my dentures yesterday. I have both upper and lower dentures. Would it be okay to get use to them one at a time? Like lowers first than uppers? Especially when eating. I tried a banana first. It was not pretty. Try mashing bananas and other foods like cooked potatos and carrots, etc or blend meats like chops or steaks. If this is your first set and put in immediately after extractions, your mouth will be very sore. If this is another set of dentures, try wearing them daylight hours and remove at night to give gums a rest and prevent soreness. I had all of my lower teeth removed 6 days ago and was fitted with a temporary denture. I was able to wear it for the first 3 days, however for the last 3 I can't put it in as the pain is too much. I see the dentist tomorrow. Is this normal? There is an adjustment period, but extreme pain should be reported to the dentist, as you are doing. Sadly most people do have pain at one point or another during the adjustment period. So glad you are going to talk to your dentist! Ask him/her about ways to manage pain and promote healing....like salt water gargles or other natural healing promoters. Ask about foods to avoid and what is ok. Be sure to to follow his/her directions carefully! Sending up lots of healing wishes and prayers! It's normal due to the inflammation and puffing. Make sure every single time you are uncomfortable, you bring it up with the dentist and it's not ignored. Good luck! It takes some time to adjust on your gums. It is a normal experience. I would recommend speaking to your dentist tomorrow and if they have any recommendations to ease the pain. Like, it is recommended to rinse with warm salt water. Of course eat soft food until you're feeling better. Or a pamphlet how to care, what to expect, what to do, etc. I had teeth extracted and immediate dentures put in about 2 weeks ago. I've been gargling with warm water with salt to help with gum swelling and sore spots. The dentures feel very strange in my mouth, but I expected this. One thing I am finding uncomfortable is the thickness of the palate. It feels like my tongue has no room to move. Will I get used to this, and also having dentures in my mouth. It takes about a month to get accustomed to dentures. You can always contact the dentist if you have questions. Check back with your dentist or whoever made your dentures to do a quick check that you are not having any swelling or starting an infection. They can also give you hints and tips to smooth out the adjustment period! Prayers for healing and smooth transitions!! PS salt water is a great healer! Keep it up if they give the ok!! I have had dentures for several years. They fit fine, but I still can't stand them touching the roof of my mouth. Is there anything I can do? I have high anxiety and want to take them out and throw them away. is is possible to grind the top denture and still have a grip. i feel that the roof of my mouth is on 'fire' after a short while?